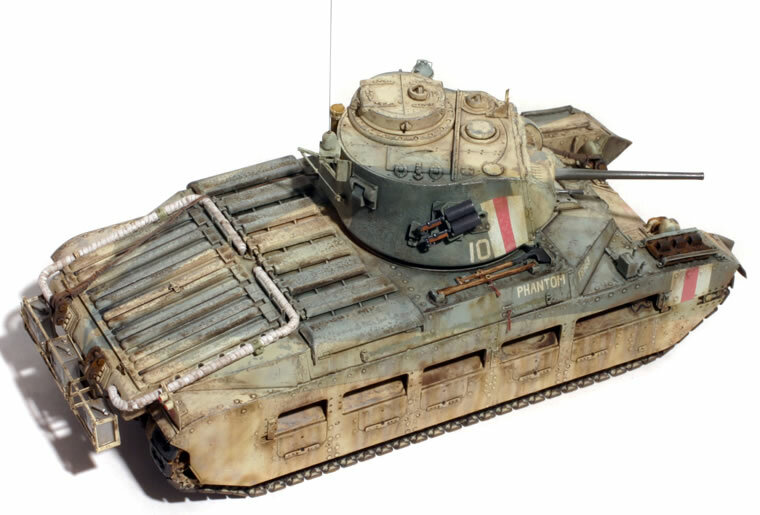 Tamiya's new 1/35 scale Matilda replaces their ancient Kit #35024. There is nothing in common between the two kits aside from the subject, and the new kit is noticeably smaller than the older and over-scale kit. The kit is up to current Tamiya standards with superb surface detail, and excellent fit. Two track options are provided, both rubber-band and link & length styrene; I used the hard plastic track. Three crew figures are provided but I used a Jakrei white metal figure on my vignette base. The kit is listed as a Mk. III/IV but available books on the Matilda are not very good indistinguishing production variations. I am indebted to Peter Brown and Shane Lovell for help in reference material for this project. Suffice it to say, I wanted to do an Operation Crusader tank in the distinctive Caunter scheme, so I modified my model accordingly. I used one of the kit decal options for "Phantom" from 42 RTR which the records list as a Mk. IIA*, a type later called Mk. III. The main configuration issues with the kit were the glacis casting and stowage. The earlier Matilda castings were flat under the driver's visor, but the kit depicts the later configuration with a thickened front to prevent bullets from ricocheting up into the base of the visor. This can be corrected with some judicous grinding under of the kit part which is thick enough to permit it. The kit comes with the later style of rear fuel drum, but the Operation Crusader tanks were fitted with a simple frame rack for six petrol or water cans. I scratch-built this from Evergreen strip and used the Ultracast resin flimsies for the cans. The kit has indented front fenders but the Crusader period Matildas had a straight shape. The Crusader Matildas had small fittings for the "Sunshields" on the side which can be added from sheet plastic. 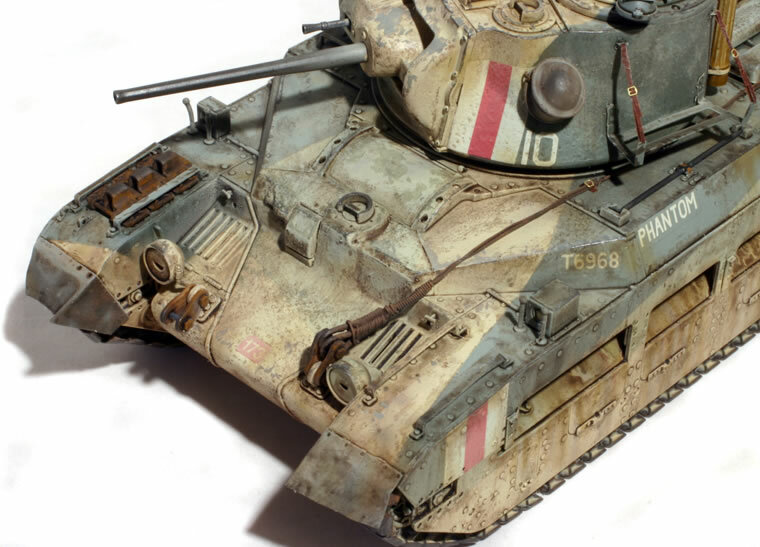 The particular tank I wanted to model had some dust covers fitted on the front which I made from wine-bottle lead sheet. 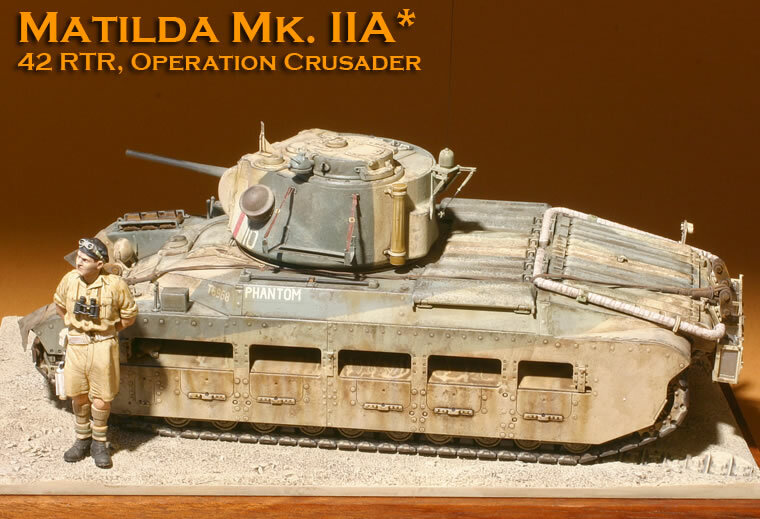 Some care is needed when building Crusader-period Matildas as the kit includes a variety of optional pieces which are suitable for later Matilda configurations but not Operation Crusader. I rebuilt the trapeze for the radio aerial which is a bit thick in the kit. I also did some minor detail work on some of the stowage, including the use of a new stowage rack on the left side of the turret from the old Eduard PE set. Otherwise, I built the kit largely from the box. Most of the work on this project was in the painting phase. The Caunter scheme requires careful masking. The basic colors are available off-the-shelf from White Ensign but I wanted "scale" colors: lighter with less color saturation. I mixed my own Portland Stone from Tamiya white and dark yellow while I used Tamiya XF-14 JA Grey for Silver Grey and XF-73 JSGDF Dark Green for Slate. Quite honestly, under all the dust and weathering, it's hard to tell the original colors. I spent far more time doing various weathering effects than the basic paint scheme. Overall, the new Tamiya is absolutely superb and will build a splendid model straight-out-of-the-box with a minimum of fuss. It has a lot of conversion and markings potential as well. 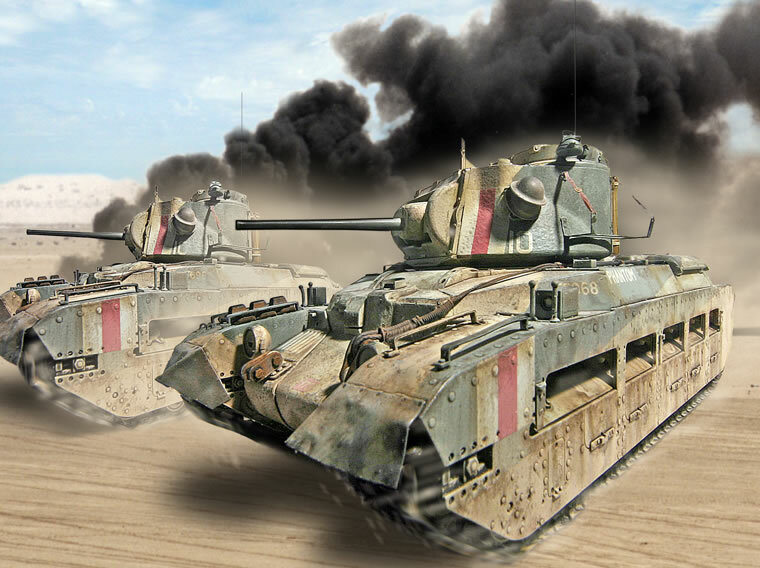 I'm doing a Military Modelling article on this project which will cover it in more detail.